A serene scene of a family pod of killer whales making their way from Johnstone Strait to Queen Charlotte Strait off Northern Vancouver Island. The light of the setting sun is caught in the plumes of their breath and turns their watery home to molten gold. One of the best ways to see these majestic marine mammals in the wild is to take a tour with one of the many operators conducting whale watching tours from Northern Vancouver Island. Whether you're only traveling as far north as Campbell River or all the way to Port Hardy, you will find an operator who will take you to the heart of downtown Killer Whale city. 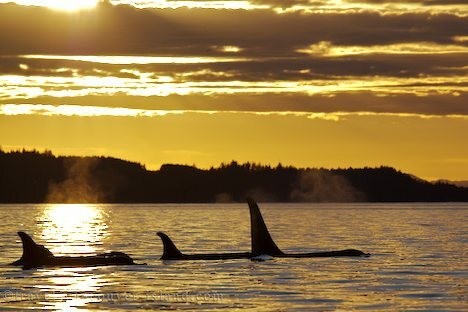 Killer Whales at sunset off Northern Vancouver Island, British Columbia, Canada. Photo of a pod of northern resident Killer Whales cruising the waters of Johnstone Strait on Vancouver Island.